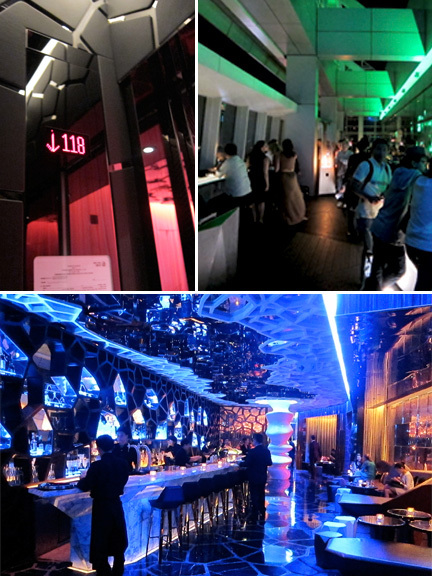 Recently, C and I were lucky enough to be taken to the recently opened Ozone Bar at the Ritz-Carlton Hotel in Hong Kong by our cousins G and D. The Ritz holds the distinction of being the tallest hotel in the world at 118 stories. 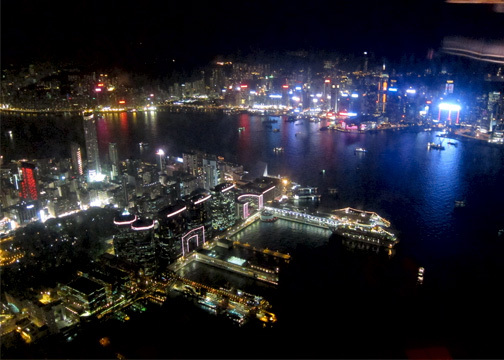 Ozone is at the 114th floor and offers stunning views of the Hong Kong Skyline. The chic bar offers you a choice of whether to stay indoors or outdoors. I would suggest that you come early and take one of the couches in the outdoor area as this gives you an excellent vantage point. 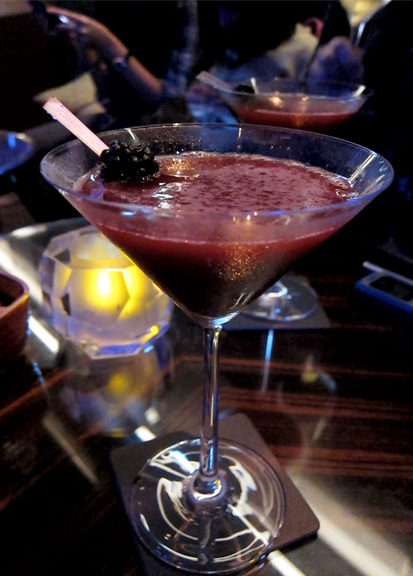 I had read about Ozone’s signature drink, Senses(HK$110) and I made sure that this was my first drink for the evening. I am not normally a cocktail drinker but I wanted to try something different before I go back to my usual Macallan. The cocktail was refreshing and was right up my alley as it had a blackberry base. I am partial to all types of berries and I always take advantage of having them in some form or the other when I travel. Shake and pour all ingredients in a Martini glass. Garnish with 2 pieces of blackberries. I know that blackberries are hard to come by in the Philippines although I have seen them being sold at the Legaspi Sunday Market or at Santi’s. I would think that blueberries or ripe strawberries could be acceptable substitutes. Got your point on the cocktail, but how would you rate the place ? Especially compared to other sky bars of Asia. Hi Richy, The bar is quite nice. Very classy without being too over-the-top. I have always felt that Hong Kong offers one of the best skyline views in the world. The drinks are priced similarly to other bars in the area as well. All in all, I would say that it is worth the experience since there is no other bar in the world placed that high up. The only one I think that can compare view wise, is the lounge at the Park Hyatt Shanghai. I think that it is in the 97th floor of the Hotel but it is completely indoors. Hope this helps. Hi! Aside from senses, what else did you try at the ozone bar? Thanks! Hi Marc, I had Single Malt Scotch after. However, one of my companions had a cosmo and it was pretty good as well. Richy, I like Sevva too. Very nice vibe and their outdoor area is one of my favorite spots. However being on the 25th floor and being on the 114th floor does make a difference. I am not saying that one is better than the other, but all I am saying is that its different. In terms of service, Ozone had quite good service although we were there early in the evening. I will not be able to tell you how things will be when it gets busier later on. Thanks for your comments and please keep reading.